Modern houses are always stunningly stylish and are a go-to choice for many homeowners these days especially in the city. 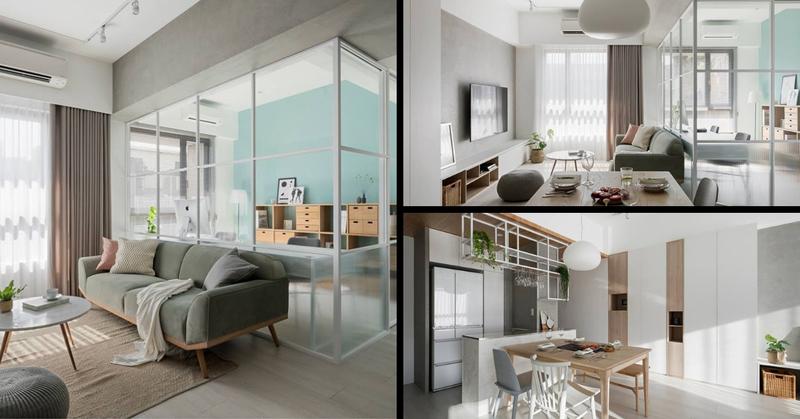 This look can rarely go wrong and Angle Design Studio has created a lovely home in Taipei with a style that uses neutral colours for a clean, spacious feel. Light neutrals such as grey, white and beige are used in the house. This is accentuated with some warm, wooden elements so that the space looks less clinical. Since the colours used are so light, it helps to diffuse the natural light pouring in from the windows more efficiently, making the space look really airy. In the living room, the minimalist feel is enhanced with basic furniture that does not have fussy details. Instead, fresh green plants are placed in strategic spots to make the area look livelier. The living room is connected to the dining area which sports a wooden dining table and minimal decor. A workroom is partitioned off using glass so that the decor still flows seamlessly but you still have privacy to retreat inside the room to do your work. There is a mini breakfast bar at the kitchen area that acts as a divider between the spaces while everything else is also similarly dressed in white with some potted plants to liven things up. If you take a closer look, the flooring is a light wood colour that makes the home look less stark. Sweet pastel colours as accents are also used to spice things up such as the feature wall in turquoise in the workroom and the pretty pillows on the sofa. Meanwhile, the bedroom keeps with the theme of minimalism with the usual neutral colours in grey, stone, cream and white. Looking at this house, it feels like an oasis of calm in busy Taipei and is perfect for young couples just beginning their lives together. All images are taken from Angle Design Studio’s Facebook page unless otherwise stated.